True or false: You can leave coffee in the pot and drink it the next day. True. Coffee will eventually grow surface mold but usually not in one day, says Donald W. Schaffner, Ph.D., extension specialist in food science and professor at Rutgers, The State University of New Jersey. But even though it’s drinkable, it won’t taste as fresh because the compounds that form coffee’s characteristic aroma and flavor are volatile, meaning they will evaporate at room temperature and be lost, says Purnendu C. Vasavada, Ph.D., a professor of food science and microbiology at the University of Wisconsin-River Falls. Refrigerating the coffee will help keep its flavor fresher the next day. True or false: You don’t really need to #refrigerate eggs — Europeans don’t. False. Well, it’s partially true. Europeans traditionally don’t refrigerate eggs, and we didn’t always have mandatory refrigeration of eggs, either. “However, the United States now requires refrigeration because we know that salmonella can sometimes (very rarely — 1 in 10,000 or 20,000 eggs) be present. If the eggs were not refrigerated, salmonella would be able to multiply to very high levels [in those rare situations],” says Schaffner. Eggs can last about three to five weeks in the fridge, as long as you purchase them before the expiration date on the carton. But don’t store them in the door of your fridge, advises Meredith H. Luce, M.S., R.D., a clinical dietitian at Florida Hospital in Orlando. Store eggs in their original containers in the center or back of the fridge, where the temperature fluctuates less than near the door. 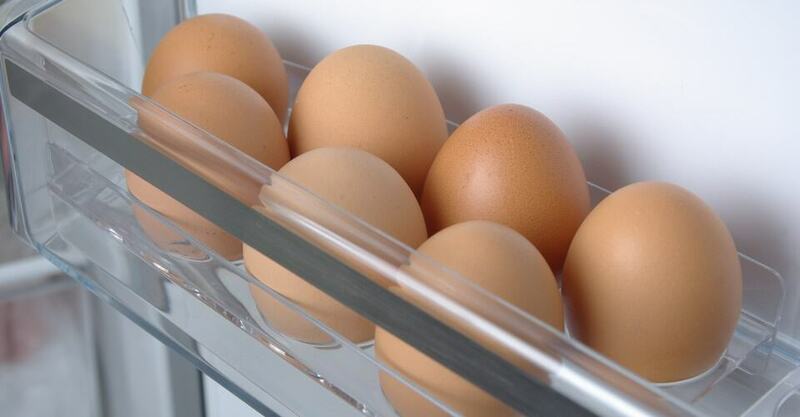 The carton guards against breakage and odor absorption and helps prevent moisture loss, which lowers egg quality. True or false: Keeping bread in the refrigerator will prevent it from going stale. If you need to keep bread longer, freeze it. The staling process stops in the #freezer. True or false: Pizza that’s been left out overnight is perfectly safe. True and false. From a taste perspective, it’s just fine; some people actually prefer it. However, “From a public #health perspective, you shouldn’t eat pizza left out for more than a few hours — it could potentially be hazardous,” says Schaffner. On the other hand, not too many people have become sick from eating pizza that sat out all night. When pizza comes out of the oven, almost all the pathogens are inactive. And between the acidic tomato sauce (not hospitable to bacteria) and the pasteurized cheese, as well as the fact that all cheese was designed to last without refrigeration, it’s probably safe from a practical standpoint. However, Schaffner cautions that if the pizza has sausage, pepperoni or other types of meat, the risk increases — he suggests tossing it. True or false: Eating bananas that have turned brown or black is perfectly fine. True. I always thought the black part of the fruit was unsafe, but it’s OK if you like the way it tastes. “The color change is due to biochemical changes in the fruit, not to the presence of harmful bacteria,” says Schaffner. The best place to store bananas is outside the refrigerator, unless you want to stop the ripening process, in which case the coolness of the fridge will do this, but it’ll also darken the peel (not the edible part). True or false: You can refreeze meat, poultry and other foods once they’ve been defrosted. True. Once frozen food is thawed in the refrigerator, it is safe to refreeze it without cooking, although there may be a loss of quality due to the moisture lost through defrosting. Also, after cooking raw foods that were previously frozen, it is safe to freeze the cooked foods. If cooked foods are frozen and then thawed in the refrigerator, you may refreeze the unused portion. Repeated freezing and thawing can affect the texture, so the quality may not be as good, but as long as the food is thawed properly (so that any pathogens present don’t multiply to dangerous levels), it is an acceptable practice, says Schaffner. However, if you refreeze foods that were left out or thawed incorrectly and have grown dangerous bacteria, you will be refreezing a dangerous food, cautions Keith R. Schneider, Ph.D., a professor of food science at the University of Florida in Gainesville. He also advises against refreezing cooked products because, he says, it’s unlikely that they will taste good. Refreezing will more than likely “cause a few taste issues — for example, if ice cream goes through several freeze-thaw cycles, you will get a defect called ‘sandiness,’ which is a gritty texture due to precipitation of lactose. If you subject meat to repeated freeze-and-thaw cycles, you may have excessive drip loss due to damage to meat tissue. The same thing happens with frozen juice,” says Vasavada. True or false: Freezer burn is caused by dangerous pathogens, and the food should be discarded immediately. False. Freezer-burned food is perfectly safe. It just won’t taste very good because it may be tough and dried out, says Schaffner. Freezer burn results from trapped air that causes moisture crystals to form around the food and change it physically. “Any alteration in the physical properties of a food will affect the taste. We’ve all witnessed how cooking a food changes it. Cut freezer-burned portions away either before or after cooking the food. Heavily freezer-burned foods may have to be discarded,” adds Luce. Freezer burn can be prevented by wrapping food tightly in a moisture-proof barrier (e.g., plastic wrap or a sealed bag). Wrapping it in multiple layers can also help. Foods that are left in the freezer too long (even when well-wrapped) will suffer freezer burn, so it’s best to wrap and date all packages, and use the oldest packages first, suggests Schaffner. True or false: Canned soup will last forever. True. According to Schaffner, “Canned soup will be safe forever. The heat process it went through killed all the bacteria.” On the other hand, the flavor, color, texture and nutritional quality will deteriorate eventually. Keep canned goods in a dry place at moderate, but not freezing, temperatures. Storing canned food at temperatures above 70 degrees will shorten its shelf life. And keep in mind that dented, swollen or rusty cans should be discarded because eating their contents could put you at high risk for food poisoning.